Mutations, but not germline. Many of the genetic alterations that we aim to investigate within the EuroEPINOMICS projects are so-called germline mutations. In the case of de novo events, these mutations have occurred in the germ cells themselves or in very early development. In the case of autosomal dominant or recessive inheritance, the mutations have been transmitted from parents. In either case, the mutation can be found in every cell of the body. Cancer research is mainly focussed on somatic mutations, which give rise to malignant transformation in already differentiated tissues. In fact, many of the techniques that we currently use in neurogenetics were developed to study somatic genetic aberrations. Array comparative genomic hybridization for example, had initially been established for these purposes before expanding the focus to germline microdeletions and microduplications. While the role of somatic mutations in cancer research is well established, the role somatic rather than germline genetic alterations play in other disorders is mainly speculative. Some initial evidence for somatic point mutations has recently been found in Proteus syndrome, a rare overgrowth syndrome. Activating somatic mutations in AKT1 have recently been identified in this disorder. A recent paper by Lee and colleagues now identifies mutations in several genes in the mTOR pathway in patients with hemimegalencephaly, a severe form of brain malformation. Hemimegalencephaly and brain malformations. Brain malformations, i.e. conditions in which the brain tissue has not developed properly, often cause severe, drug-resistant epilepsy. While smaller malformations can be excised through epilepsy surgery, the management of larger malformations is difficult. Hemimegalencephaly (HME), literally overgrowth of one side of the brain, lies at the extreme end of the brain malformation spectrum. In HME, an entire hemisphere is dysplastic and enlarged. In many cases, hemispherectomy, i.e. disconnection of the affected hemisphere, is the treatment of choice for HME. The Barkovich classification lists HME as a disorder of non-neoplastic neuronal proliferation, i.e. an abnormality of cortical development that affects very fundamental aspects of brain growth. Within this classification based on histological and morphological criteria, HME find itself in the same group as the cortical harmatomas of Tuberous Sclerosis Complex (TSC) and the cortical dysplasias with balloon cells. In TSC and increasingly in dysplasia with balloon cells, disturbances of the mTOR pathway have been described. At least in the giant astrocytomas of TSC, the mTOR inhibitor everolimus is also used therapeutically. The close relationship might already suggest a shared functional pathway. The results by Lee and colleagues now suggest that somatic mutations in the same pathway can be found in the dysplastic tissue in HME. What is the mTOR pathway? The abbreviation mTOR stands for mammalian target of rapamycin and refers to an essential pathway that regulates cell growth in reponse to a wide range of stimuli. Rapamycin, initially used as an immunosuppressant, has been found to inhibit a critical element in this pathway. Dysregulation of the mTOR pathway has been implicated in many pathological conditions including dysplasias of the Central Nervous System. 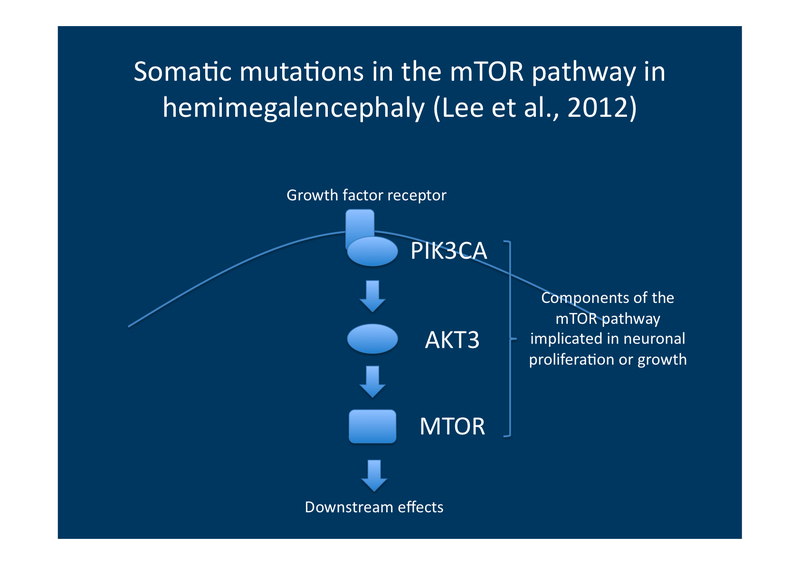 Components of the mTOR pathway implicated in neuronal proliferation. The recent study by Lee and colleagues finds mutations in PIK3CA, ATK3 and MTOR in patients with hemimegalencephaly. Mutations in AKT3, MTOR and PIK3CA in HME. Lee and colleagues performed whole exome sequencing in brain tissue in patients who had surgery because of HME and compared this with the genetic sequence of the patient derived from other tissue such as blood. They identified mutations in affected brain tissue in mTOR pathway genes in 6/20 patients with HME, suggesting that disruptions of this pathway might be implicated or even causative for the condition. One patient had a somatic mutation in AKT3, another a somatic mutation in MTOR and four patients had the same somatic mutation in PIK3CA. All three genes are essential within the mTOR pathway. The role of somatic mutations in epilepsy. A possible role for somatic mutations in epilepsies has repeatedly been suggested, but actual evidence has been scarce. The work by Lee and colleagues applying whole exome sequencing to HME now provides a first insight into molecular mechanism underlying epilepsy that occur somatically rather than in the germline. Given that the human brain is probably prone to functional disruptions through single gene defects, this might imply an increasingly recognized role of this mechanism in human epilepsy. This entry was posted in 2012, Brain malformations, Epileptic encephalopathy, Publications and tagged AKT3, Brain malformations, comparative genomic hybridization, hemimegalencephaly, mTOR, PIK3CA, somatic mutations, treatment-resistant epilepsy. Bookmark the permalink.